Swim Training with out Water. Exercises for swimmers, that can be done at various times of the day. The Middle school swimmers helped give them names today at training. Fo the rest of the semester, the High School Swimmers who train with Coach Andy will going to the school fitness room to do a strength training program. They will do this on Monday, Wednesday and Friday. If you have any concerns, please first read the article below, then send me an e-mail if you have any questions. Strength training is much more than quickly lifting a few weights. When you strength train with weights, you’re using your muscles to work against the extra pounds; this strengthens them, so you are stronger and have more endurance when you swim. The program you are starting is designed to make you physically stronger and to have more endurance, it is not designed specifically to make you bigger, that is called Body Building, yes if you use muscles they will get bigger, but that is not our main purpose, our aim is make you faster for swimming. There’s a big difference between strength training, weightlifting, power lifting, and competitive bodybuilding! We will be focusing on STRENGTH TRAINING, we definitely will not be body building or Power Lifting. Power lifting, concentrates on how much weight a person can lift at one time. This type of power lifting is not recommended for people in their early teens, because a person’s body is developing fast during this time and this type of activity can lead to serious injuries of growing bones, muscles, and joints. Most people who work out with weights typically use two different kinds: free weights, which include barbells and dumbbells, and weight machines, which are made by companies like Nautilus. Machines are often designed to help you isolate and work on a specific muscle; free weights usually work a group of muscles at the same time. For instance, you can do a squat using free weights by placing a barbell across the back of your shoulders and squatting down like a baseball catcher. This type of exercise works multiple muscles, including the quadriceps (the front of the thigh), the hamstring (the back of the thigh), and even your gluteus maximus (your behind.) When you do a leg extension on a muscle isolation machine, you sit in a chair with your knee bent at 90 degrees and slowly straighten your leg against the padded bar. This particular exercise isolates and works the quadriceps muscle. The school fitness room has free weights and machine weights, we will be using a combination of both to strengthen different groups of muscles. What Are Some Dangers of Strength Training? You may love the challenge of lifting, especially if you and your friends do it together., you’ll definitely see results over a few months in your muscles and in your ability to progressively lift more weight. But there are a few things to look out for. Because your bones, joints, and tendons are still growing and developing, it’s easy to overdo it and strain or even permanently damage them. Take it easy, the strength training program you will be doing is is designed to help your swimming, not make you bigger. When you’re in the middle of a strength-training session and something doesn’t feel right to you, stop what you’re doing and have a doctor check it out before you resume training. It’s possible you may need to modify your training or even stop lifting weights for a while to allow the injury to heal. Another danger surrounding strength training is the use of anabolic steroids or other performance-enhancing drugs and pills that supposedly help muscles develop. You may have even heard rumours about some athletes at your school who use them. Steroid use is widespread in many sports – including bodybuilding, baseball, and track and field. But because many of their long-term effects on the body are still unknown – and because they are linked to health problems like cancer, heart disease, and sterility – you should not use them. The benefit is definitely not worth the risk! What Is a Healthy Routine? If you’re just starting out in the weight room, most fitness experts recommend you begin by training three sessions a week, ranging from 20 minutes to an hour, allowing at least a day off between sessions. Before you head for the weight bench, you should warm up your muscles by spending 10 minutes either riding the stationary bike, use the vaso trainer, run on the treadmill or use the rowing machine, you could even take a 10 minute fast walk. There are many different exercises you can use for each body part, I have given you specific exercises to do that relate to swimming, perform 3 sets of 8 to 10 repetitions (or reps) of each exercise, starting out with a lighter weight to warm up and then increase the weight with the second and third sets. The routine will change after a few weeks. Don’t work out with weights more than three times a week. And never weight train on back-to-back days. Warm up for 10 minutes before each session. Spend no more than 30 to 40 minutes in the weight room to avoid fatigue or boredom. Ensure you’re using proper technique through supervision. Improper technique may result in injuries, particularly in the shoulder and back. Strength training is a great way for teens to improve their strength, endurance, and muscle tone. But remember to start slowly, use proper form, avoid heavy weights, and increase your workouts gradually to prevent injury. Just a few short sessions a couple of days a week will really pay. What happens if you don’t get to warm up in the pool before a race, or the warm up was more than an hour ago? You need to activate your body ready to race. To do that you need to do a dynamic dryland warmup. What is the difference between static, active, dynamic, PNF & functional stretching? Which type of stretching is better and how to do these stretches. All questions answered below. As the name suggests, static stretching involves holding a muscle at the stretched position for 20 -30 seconds. No additional benefit has been shown to extend the stretch for more than 30 seconds. Static stretching is best done after your workouts. It has shown to decrease strength and power if done immediately before weight training. The stretch is held when you feel a nice stretch ( or slight discomfort) until you feel the muscle relaxing. 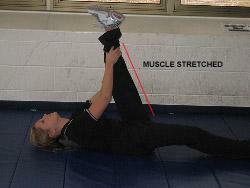 In the picture, a common hamstring stretch called the straight leg raise is shown. Active stretching involves stretching the muscle actively. In other words, you are holding the stretched position with the opposing muscle group. You muscles are playing an active role in holding the stretch position. In the picture example, the hamstrings are stretched by using your quadriceps (opposing muscle). You cannot hold this position for more than 5-10 seconds. She is only using her hands for support and is not holding the leg up with her hands. Dynamic stretching is similar to active stretching. However, in dynamic stretching you don’t hold the stretch. You are always moving or dynamic. Dynamic stretching is not the best for improving flexibility. But it is good way to warm up for your sport and has shown to improve performance. Propioreceptive Neuromuscular Facilitation (PNF) is said to use receptors to improve the neuromuscular (related to nerves & muscles) response of the body. The flexibility gained can be maintained by doing PNF stretches of minimum one repetition for at least 2 times a week. There are different ways to do PNF: Contract relax, Contract-Hold relax and so on. Usually, PNF is performed with the help of a partner. But you can do it on your own with a towel for resistance. Atleast if you get hurt, you have only yourself to blame. To perform a hamstring PNF stretch, stretch till you feel a slight discomfort, contract the hamstring isometrically (without moving) for 3-5 sec, relax the muscle and slowly deepen the stretch using your quadriceps (opposing muscle). Repeat the cycle 3-4 times. Try it, it just sounds complicated. PNF yields greatest gains and is the fastest way known to improve the range of motion or flexibility.Recent studies have shown that there is nothing neural or propiorecptive about PNF and is due to an increase in stretch or pain tolerance. So forget the term “PNF”. Functional Stretching is something which came out recently. Most of the strength coaches now lean towards functional stretching to improve flexibility in their athletes. Athletes mainly use free weights and not much machines because of the theory of specificity. The theory says that strength, coordination, speed, & balance is highly specific to the movement. Based on the same theory, if you want the newly gained ROM to show up in your movements (or have the strength and coordination), the stretching should be functional or specific. Since most movements are ground based (or standing), it makes a lot of sense to do lower body stretches standing on your feet. Use static or PNF stretching if the muscle is really tight. Better to avoid static stretching before your workouts. Functional stretching is a better option to PNF & static, atleast theoretically. Use dynamic stretching as warm up rather than static stretching. Maintain the arch in your back and keep the non-stretched leg straight and toes pointed upright. Always remember to breathe while streching. Stretching shouldn’t be painful. Meets, swimathon, and swimming in the rain. Help the swim club raise funds for charity and for equipment and awards. We hope that each swimmer will participate in the Swimathon to the best of their ability. 5. Upon completion of the Swimathon, students will get their lap count approved. A volunteer will record each student’s lap total on their pledge sheet and return it. Students may then collect outstanding pledges. Please pay the pledges to the school cashier into the Sailfish Account as well as return the pledge sheets to the ISM Sailfish Swim Club by Friday 10th December. I had a swimmer remark to me at training this week that we should not swim in the rain because rain makes you sick. This is incorrect, rain does not make you sick, often sickness occurs in the winter or during the wet season, which happens to coincides with the Flue Season. A phenomenon that occurs world wide, when the seasons strain of influence is passed from person to person, rain does not spread sickness. During the wet season the incidence of mosquito bites increases because mosquitoes lay their eggs in still water. Rain causes puddles, mosquitoes lay eggs and the number of mosquitoes increase. Again rain does not spread disease, mosquitoes do. We will train in the rain, e will not swim if there is lightening. Rain does not make you sick, yet lightening can kill you. Sailfish Swim Club is starting this Monday the 13th, come along to tryouts. We will ask you to swim Freestyle and Backstroke, then Breaststroke. You do not need to be a champion swimmer to join, we cater for all abilities. We want to see how well you swim not how fast, once we have seen you swim you will be put in a squad that suits your ability. Elementary School can up to 3 times a week. It’s ok if you come less though, we encourage to be good at lots of different sports. We have 3 ES squads, Squad 1 is generally is for swimmers new to the sport, and focus on Freestyle, Backstroke and Breaststroke. They Train 2:30-3:15, Monday, Wednesday and Friday. Squad 2 concentrates on perfecting FR, BK, and BR, and are learning Butterfly (BF) They train Tuesday, Wednesday and Thursday. Squad 3 is the top Elementary Squad and train Tuesday, Wednesday and Thursday. Middle School either come three times a week for those still learning, or 5 times a week for those who have been swimming a long time and are ready to train for performance. We have 3 Squads, MS1 is for swimmers new to teh sport and are technique focused with some conditioning work, and train Monday Wednesday and Friday. Squad 2 combines technical and conditioning training and train Tuesday, Wednesday and Thursday. Squad 3 trains with the High School Squad and is a performance focused squad. They train 5 times a week Monday-Friday. High School either three times a week for those new to the sport or 5 PLUS times for those who are after Performance training. Hi folks, welcome back, I’m sure many of you have or are struggling with jet lag, waking up at 2:00am in not pleasant, thankfully it gets better every day and eventually goes away. I’m really looking forward to a fun and fast new swimming season, we have some new things lined up for you, more about this in later posts. Training for MS and ES swimmers who swam with the Sailfish last season start training on Friday. Everybody welcome. People new to ISM or who want to join the Sailfish Swim Club please come to training next week Monday-Friday for an assessment. Please ask for Coach Andy, I will watch you swim and decide which squad will suit you best. Once you have been assessed I will e-mail you a registration form, please fill it in and e-mail back to me. … If you miss reaching HGH release during working out, you will still receive the calorie burning benefit from the workout. However, you’ll miss the HGH “synergy bonus” of enhanced fat burning for two hours after working out. “Through a system of motors, pulleys, cams and sensors it adds weight when a person is performing a lowering motion, and removes that weight when the person is lifting. As a result, the body starts seeing loads, resistance, and forces that it doesn’t normally see”. Below are releases on studies appearing in the June issue of Pediatrics, the peer-reviewed, scientific journal of the American Academy of Pediatrics (AAP). Before families head to the beach or pool this Memorial Day, the American Academy of Pediatrics (AAP) has updated guidance on water safety and drowning prevention. In its updated policy, the AAP has revised its guidance on swimming lessons and highlights new drowning risks – including large, inexpensive, portable and inflatable pools – that have emerged in the past few years. Fortunately, drowning rates have fallen steadily from 2.68 per 100,000 in 1985 to 1.32 per 100,000 in 2006. But drowning continues to be the second leading cause of death for children ages 1 to 19, claiming the lives of roughly 1,100 children in 2006. Toddlers and teenaged boys are at greatest risk. “To protect their children, parents need to think about layers of protection,” said Jeffrey Weiss, MD, FAAP, lead author of the policy statement and technical report, which will be published in the July print issue of Pediatrics and released early online May 24. In the new policy, the AAP reinforces its existing recommendation that most children age 4 and older should learn to swim, but the AAP is now more open toward classes for younger children. In the past, the AAP advised against swimming lessons for children ages 1 to 3 because there was little evidence that lessons prevented drowning or resulted in better swim skills, and there was a concern parents would become less vigilant about supervising a child who had learned some swimming skills. But new evidence shows that children ages 1 to 4 may be less likely to drown if they have had formal swimming instruction. The studies are small, and they don’t define what type of lessons work best, so the AAP is not recommending mandatory swim lessons for all children ages 1 to 4 at this time. Instead, the new guidance recommends that parents should decide whether to enroll an individual child in swim lessons based on the child’s frequency of exposure to water, emotional development, physical abilities, and certain health concerns related to pool water infections and pool chemicals. The AAP does not recommend formal water safety programs for children younger than 1 year of age. The water-survival skills programs for infants may make compelling videos for the Internet, but no scientific study has yet demonstrated these classes are effective, the policy states. The updated policy also outlines the danger of body entrapment and hair entanglement in a pool or spa drain. Special drain covers and other devices that release the pressure in a drain can prevent such incidents. Never – even for a moment – leave small children alone or in the care of another young child while in bathtubs, pools, spas or wading pools, or near irrigation ditches or standing water. Bath seats cannot substitute for adult supervision. Empty water from buckets and other containers immediately after use. To prevent drowning in toilets, young children should not be left alone in the bathroom. Closely supervise children in and around water. With infants, toddlers and weak swimmers, an adult should be within an arm’s length. With older children and better swimmers, an adult should be focused on the child and not distracted by other activities. If children are in out-of-home child care, ask about exposure to water and the ratio of adults to children. If you have a pool, install a four-sided fence that is at least 4 feet high to limit access to the pool. The fence should be hard to climb (not chain-link) and have a self-latching, self-closing gate. Families may consider pool alarms and rigid pool covers as additional layers of protection, but neither can take the place of a fence. Children need to learn to swim. AAP supports swimming lessons for most children 4 years and older. Classes may reduce the risk of drowning in younger children as well, but because children develop at different rates, not all children will be ready to swim at the same age. Do not use air-filled swimming aids (such as inflatable arm bands) in place of life jackets. They can deflate and are not designed to keep swimmers safe. All children should wear a life jacket when riding in a boat. Small children and nonswimmers should also wear one at water’s edge, such as on a river bank or pier. Parents should know the depth of the water and any underwater hazards before allowing children to jump in. The first time you enter the water, jump feet first; don’t dive. When choosing an open body of water for children to swim in, select a site with lifeguards. Swimmers should know what to do in case of rip currents (swim parallel to the shore until out of the current, then swim back to the shore). Counsel teenagers about the increased risk of drowning when alcohol is involved. News Highlights – May 17, 2010.